Star Wars Battlefront II puts you in control of a host of heroes and villains from across the Star Wars universe. 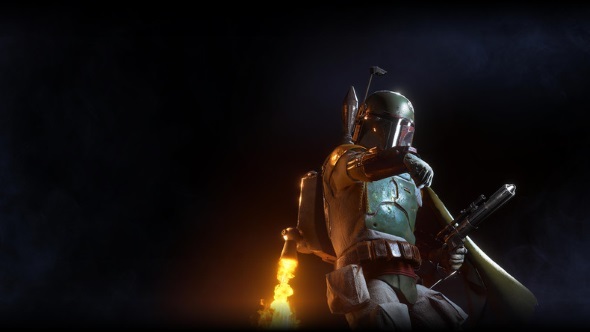 Whether you’re twirling Rey’s lightsaber or taking to the skies as Boba Fett, you will need to know what you’re doing – they cost a lot of Battle Points and you don’t want to save up only to just die instantly, after all. But that’s where our Battlefront II heroes guide comes in. If you’d rather stick with the regular ground troops, try our Star Wars Battlefront II class guide. We’ve put together a list of these heroes and villains, along with all the cool skills and boost cards they can use, to give you a chance to get ready for war. There are currently 14 heroes and villains available, with more to come in free DLC. Han throws a sticky charge which can be detonated at will. 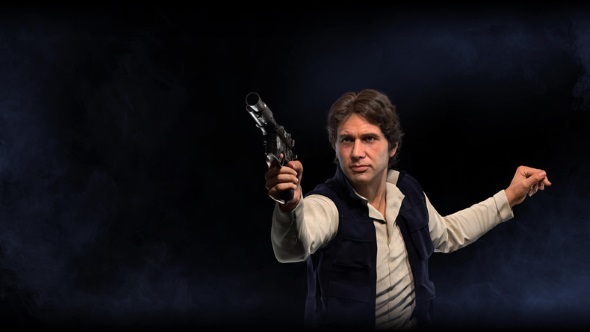 Han can fire the DL-44 rapidly for the next few seconds. Han charges forwards, knocking over and damaging the first enemy he hits. Each defeat with Sharpshooter will reduce the recharge time before the ability can be used again. Each defeat with a Shoulder Charge tackle will reduce the recharge time before the ability can be used again. Sharpshooter has a longer duration. An improved capacitor allows Han Solo’s DL-44 blaster builds less heat when firing. Han Solo takes less damage when using Shoulder Charge. If Detonite Charge is detonated before attaching to a surface, it will deal bonus damage. Scoring three headshot hits in a row without hitting any other body part will reset a part of all Han Solo’s abilities recharge time. After each headshot kill, Han Solo is able to fire his DL-44 blaster without overheating for a short period. Letting the Detonite Charge sit for five seconds after it has attached to a surface will increase its blast radius. 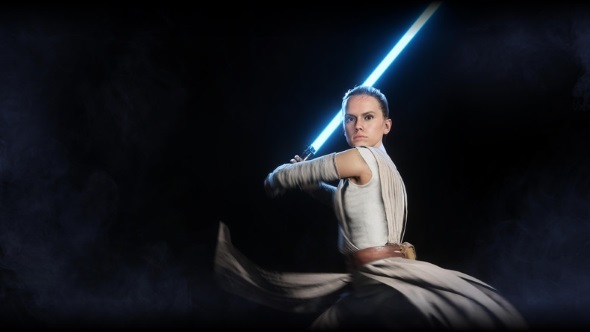 Rey charges forward with her lightsaber, dealing damage to enemies on the way. Rey causes nearby enemies to be dazed and confused for a brief duration. Rey senses her surroundings, revealing all nearby enemies to her. Stamina and damage are also increased while the ability is active. Insight has an increased area of effect. Insight will be active for a longer period of time. As a self-trained fighter, Rey’s melee strikes drain less stamina. Whenever Rey defeats an enemy trooper, she regains twenty health and whenever she defeats an enemy villain she regains even more. Mind trick has an increased area of effect. Mind trick has a longer duration on targets that are revealed by Insight. Rey deals bonus damage to enemies affected by any immobilizing effect, including Mind Trick. Rey receives less damage while charging forward with Dash Strike. Rey will deal more damage with Dash Strike for each target. Enemies around Boba Fett are revealed for a short period of time. Boba Fett vanishes from enemy radars and can utilise unlimited jetpack fuel. A hail of small rockets is launched from Boba Fett’s gauntlet. Boba Fett fires a single concussion shot, dazing enemies caught in the blast. For The Hunt will reveal enemies for your allies for a part of its duration. For The Hunt reveals enemies for a longer duration. Concussion Rocket will concuss enemies for a longer duration. Enemies concussed by Concussion Rocket will also have their blasters disabled for a period of time. Boba Fett’s jetpack fuel refills faster when not being used. Rocket Barrage fires faster, increasing the total number of rockets fired. Boba Fett’s Jet Pack fuel resource deplete slower when flying. Boba Fett takes less damage when using Rocket Barrage while flying with his jetpack. Rocket Barrage deals bonus damage to enemy Heroes. Darth Maul uses the Force to choke his enemies and throw them to the ground. 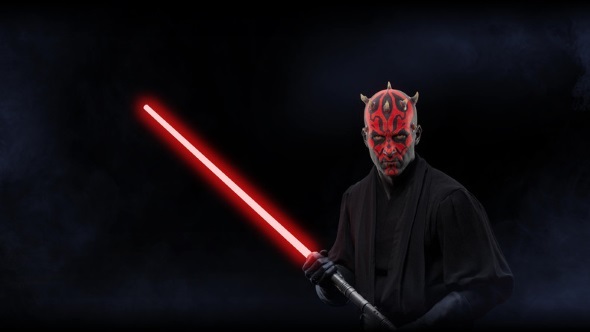 Darth Maul hurls his lightsaber, damaging all enemies it touches. 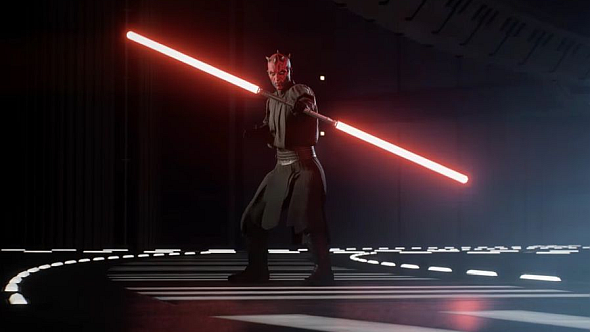 As Darth Maul eliminates more enemies his ability cooldowns are lowered. Darth Maul flings his Furious Throw more violently, making it deal more damage. Choke Hold throws the enemy farther away. When Darth Maul Choke Holds two or more enemies, the damage is increased. Choke Hold has an increased area of effect. Darth Maul receives less damage from blasters. Melee strikes will drain less stamina. A thrown grenade which releases a potent cloud of dioxis gas that will damage enemies who stand within. Bossk loads his gun with high-damage micro grenades and engages his Trandoshan instincts, gaining thermal vision and enhancing his physical strength. Bossk throws out three sticky mines that detonate on proximity trigger, dealing high damage. Dioxis Grenade cloud is wider and thicker. Dioxis Grenade will spew out smoke for a longer duration. The Proximity Mines will arm and activated faster when deployed. Bossk throws out two additional Proximity Mines that have a larger detonation radius. Bossk will regain a small amount of health each second he stays within the cloud from the Dioxis Grenade. For every enemy Bossk defeats while Predator Instincts is active, the recharge time of his other abilities are shortened. 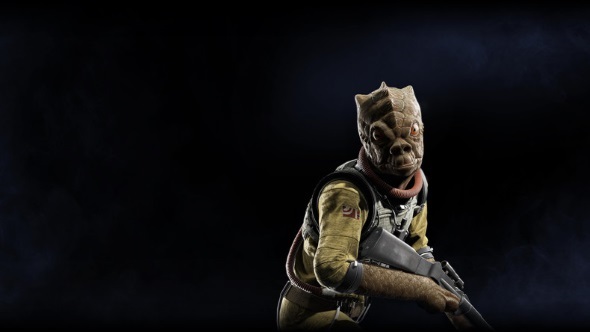 Each headshot will instantly disable Bossk’s Relby V-10 blaster overheat for a short period. Every enemy Bossk defeats while Predator Instincts is active will extend the ability’s duration. While Predator Instincts is active, Bossk becomes less vulnerable to damage. Chewbacca throws a grenade which can be broken into a cluster of smaller missiles which electrocute enemies they hit. 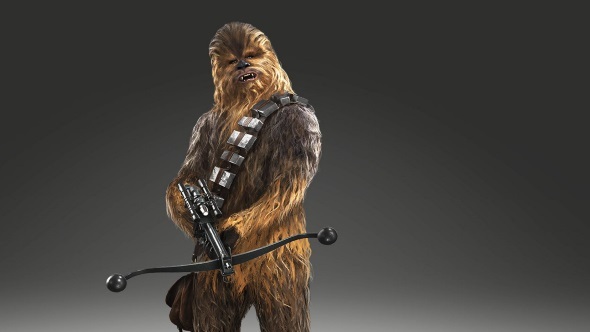 Chewbacca roars and overcharges his bowcaster, enabling him to fire fully charged shots with no charge time. Chewbacca charges forward and slams his fists into the ground when retriggered, dealing high damage and knocking enemies off their feet. This ability can be activated from the air. For every enemy Chewbacca defeats while Furious Bowcaster is active it will extend its duration. Chewbacca receives less damage from blasters while Furious Bowcaster is active. The Shock Grenade will shock enemies for a longer duration, but has a 20% longer recharge time. The Shock Grenade splits into more parts, shocking a wider area. Chewbacca receives less damage while using Charge Slam. Chewbacca’s melee attacks are stronger and deal more damage. Chewbacca has increased maximum health. Enemies that are hit by Shock Grenade will be more vulnerable to all damage for the shock duration. Charge Slam deals bonus damage to enemies that are within half the radius of its blast. Darth Vader throws his lightsaber, cutting through and dealing damage to any enemies in the way. Darth Vader channels the dark side of the Force and focusses his rage. His melee strikes drain no stamina and deal bonus damage. Darth Vader chokes a cluster of enemies ahead of him, dragging them off the ground and through the air to drop them into danger. Every enemy Darth Vader defeats while Focused Rage is active will extend its duration. Darth Vader receives less damage while Focused Rage is active. Darth Vader has increased maximum health. Whenever Darth Vader defeats an enemy trooper, he regains twenty health. Whenever he defeats an enemy hero, he regains even more. Deflecting blaster projectiles will drain less stamina. Lightsaber Throw deals bonus damage to enemies hit by it a second time in one throw. 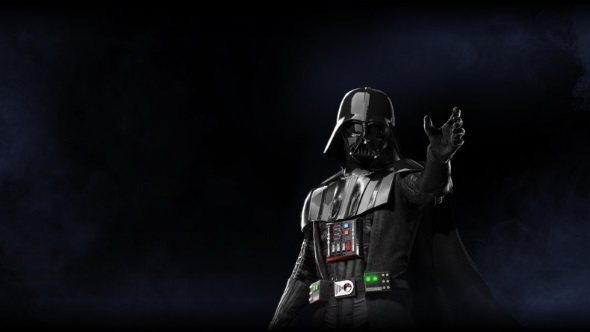 Enemies that are Choked will have a tougher time releasing themselves from Darth Vader’s grip. Darth Vader deals more damage when Choking two or more enemies. Emperor Palpatine unleashes a burst of lightning which hits a target and spreads to those around them. 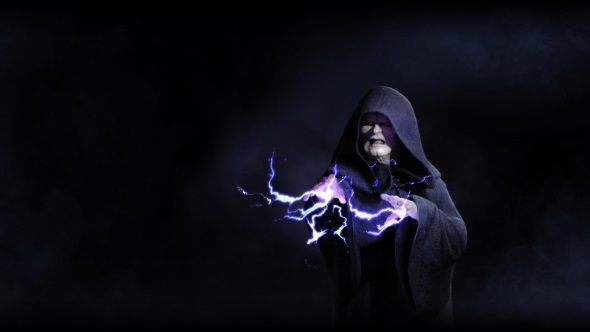 Emperor Palpatine charges the air around him with Force energy, damaging those around him and slowing their movement. Emperor Palpatine electrocutes enemies in front of him, immobilizing them. Electrocute has an increased area of effect. Electrocute will shock enemies for a longer duration if it hits three or more targets. If there are three or more enemies within Dark Aura, it deals bonus damage. Dark Aura grows larger and larger for as long as it is active. Every target struck by Chain Lightning will heal Emperor Palpatine for a small amount of health. Chain Lightning can bounce to more targets. Emperor Palpatine’s two-handed lightning attack deals bonus damage to enemies that are Electrocuted. Emperor Palpatine’s lightning attacks have increased range. Emperor Palpatine’s lightning attacks drain less stamina. Iden sends her droid to an enemy in front of her, stunning the target. The stun can chain to nearby enemies. An incredibly powerful long-range rifle utilizing the frame assembly of a DLT-20A. The shots are charged for maximum damage. Iden’s droid creates a shield around her, protecting her from incoming blaster damage. 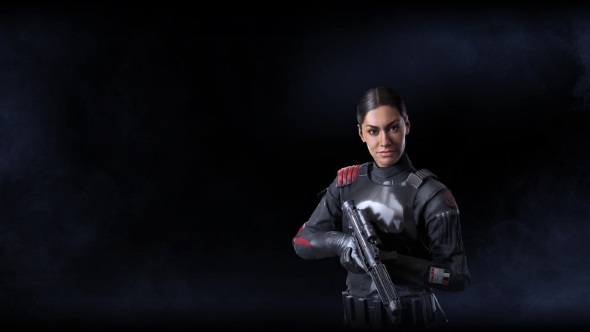 Whenever Iden Versio hits someone with Pulse Cannon she will reveal them for her and her allies for a short period of time. Iden Versio’s TL-50 can use its alternate fire more frequently. Droid Shield has more maximum health. Droid Shield will be active for a longer time. Stun Droid has an increased area of effect when it shocks enemies. Stun Droid has an increased area of effect when searching for viable targets. Pulse Cannon has a shorter recharge time. Stun Droid and Droid Shield both have decreased recharge time. Iden Versio’s TL-50 builds less heat when fired. Kylo Ren uses the Force to pull enemies ahead off their feet and towards him. Kylo Ren enters a frenzied rage and leaps from enemy to enemy, striking them with his lightsaber. Kylo Ren freezes all enemies in front of him, immobilizing them for a duration. Kylo Ren can leap a longer distance when attacking with his Frenzy attack. Kylo Ren can strike more times with his Frenzy attack. If Kylo Ren freezes more than three enemies the duration of Freeze is longer. Freeze has an increased area of effect. Pull will now also damage enemies. Pull has an increased area of effect. Kylo Ren’s lightsaber strikes drain less stamina. 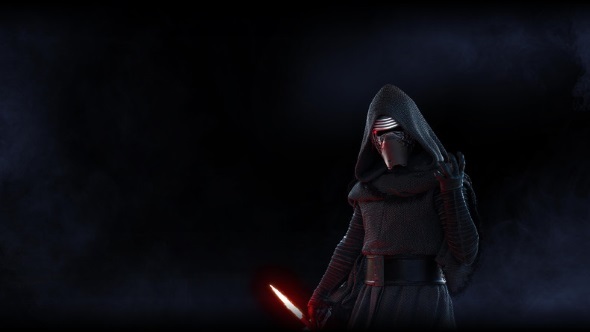 While Kylo Ren’s health is below 25% he will deal bonus damage with his lightsaber. Whenever Kylo Ren is in close proximity of another villain he is strengthened and deals more damage with his lightsaber strikes. Lando Calrissian throws a smoke grenade which obscures the view of his enemies, but not of his Night Sniper’s thermal scope. Lando Calrissian focuses on up to five enemies before delivering a flurry of powerful shots against each one. Lando Calrissian deploys a sticky device which reveals nearby enemies and disrupts their radars. He can overcharge this disabler at any time to shock enemies around it. Smoke Grenade lingers for a longer duration. Smoke Grenade cloud is larger and thicker. Lando Calrissian’s Disabler will stick around for a longer period before it auto-detonates. The area of effect of the Disabler will grow larger over the course of five seconds after attaching to a surface. If the Disabler is detonated within 5 seconds of attaching to a surface, the shock explosion is stronger and enemies are shocked for a longer duration. Sharp Shot can target enemies at a longer distance. If Sharp Shot hits three or more targets, the recharge time to the next one is reduced. Disabled overheat lasts longer when perfectly cooling the X-8 Night Sniper blaster. 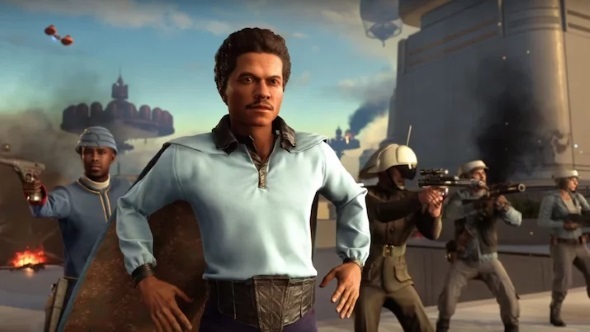 Lando Calrissian has more base maximum health. Leia Organa throws a flash grenade which detonates on impact, blinding and confusing enemies in the blast area. Leia Organa swaps her blaster for an enhanced E-11 Assault Rifle which allows her to blast enemies with a stream of aggressive laser fire. Leia Organa deploys a squad shield at her location. The shield protects her and those inside from blaster fire. Leia Organa can deploy the Squad Shield more often, as the recharge time is reduced. Squad Shield has increased maximum health. Leia Organa can regenerate more base health. Flash Grenade will blind enemies for a longer period. Enemies that are blinded by Flash Grenade are also revealed to Leia for a short period. 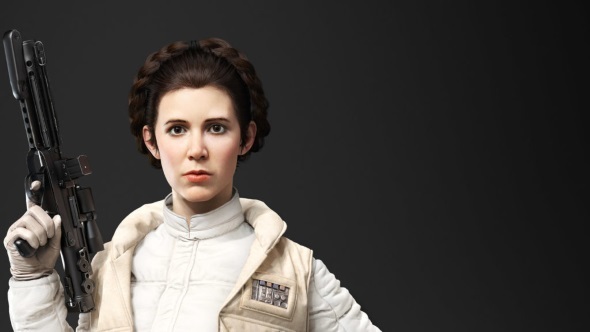 Leia Organa receives less damage while wielding the E-11 rapid fire blaster. The E-11 rapid fire blaster can be wielded for a longer period. Whenever Leia Organa defeats an enemy trooper, she regains twenty health and whenever she defeats an enemy villain she regains even more. The alternate fire on Leia Organa’s Defender blaster deals bonus damage. Luke Skywalker uses the Force to push enemies in front of him, knocking them over ledges or into danger. 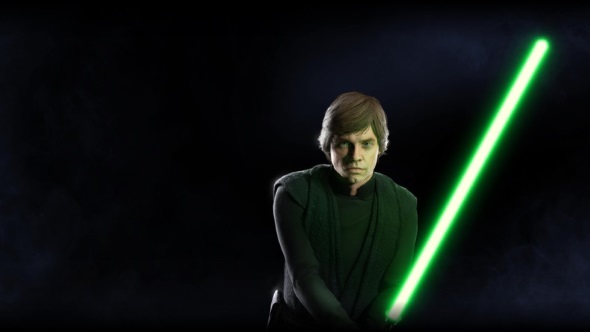 Luke Skywalker sends a burst of Force energy out from the ground, dealing damage to any enemies nearby. Luke Skywalker uses the Force to enhance his speed and quickly move in any direction. Every Rush makes Luke Skywalker more resistant to damage for three seconds. Luke Skywalker can do one extra Rush, but the recharge time is slightly increased. Repulse has an increased area of effect. Luke Skywalker’s melee strikes and blaster deflections both drain less stamina. Blocked blaster shots are deflected super accurately, but drain more stamina. Whenever Luke Skywalker defeats an empire soldier he regains twenty health and whenever he defeats an enemy villain he regains even more. Push as an increased area of effect. Repulse will deal bonus damage to targets standing within half of its radius. Unleash the Force in a cone in front of Yoda, damaging and pushing enemies back. When Yoda blocks damage using his block ability, the range and damage of Unleash increases for a short time. Yoda instantly heals himself and allies around him. 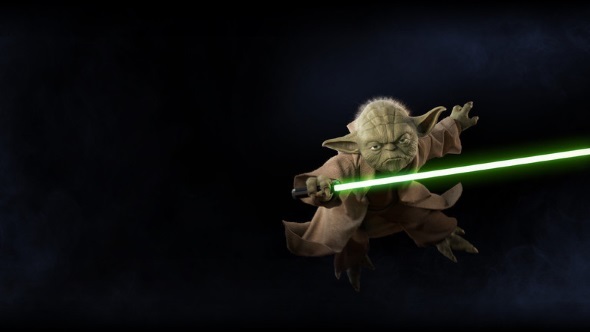 Yoda leaps forward, dealing damage to enemies he hits on the way. He can perform the move 3 times in quick succession. The area of effect of Unleash grows faster when absorbing blaster shots. The area of effect of Unleash minimum size is larger. When the Unleash radius is at maximum distance, unleashing it will deal bonus damage. Presence in active for a longer duration. Presence gives Yoda more bonus health when activated. Yoda can do one extra Dash Attack, but the recharge rate is slightly lower. Yoda swings his lightsaber with ease, draining less stamina when striking. Yoda deals more damage with his lightsaber strikes to villains. Yoda receives less overall damage.